Yes I am still working on the backlogged recipes. Sometimes I get the feeling in my over enthusiasm have I joined too many groups? Maybe but don’t feel backing out of any. They all offer different challenges.The baking eggless group was back in February after a short break. I couldn’t do the Feb challenge but made the March one. 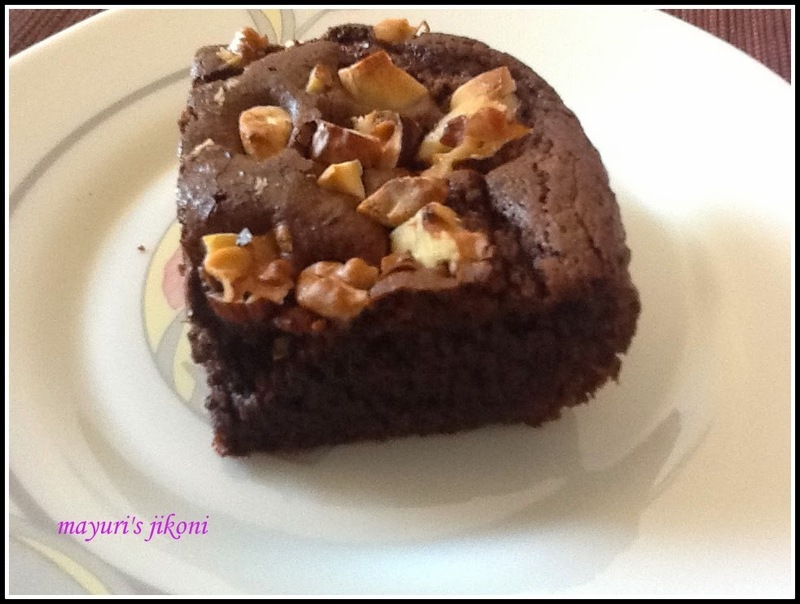 The brownies are extra chocolatey, loaded with nuts and so delicious. The brownies turned baked well, and just as I turn it out onto the wire rack, the glass tray in which I had baked it fell and broke! The baking tray belonged to my mother in law and have been using it for over 32 years! Did feel bad. I found that my 8″X 8″ baking tin was all rusted. We get salty water in our taps and everything rusts so quickly. We have to buy bottled water for cooking and drinking. Anyway next trip to the supermarket I am buying a 8 X 8″ tin. Coming to the brownies, the challenge is that we are given a recipe which has eggs. We have to make it eggless. I just substituted the eggs with yogurt. The brownies were fudgy and nutty. I love the taste of the sea salt in every bite. It balanced the sweetness. Even though any glass breaking is considered lucky, do you still feel really bad when something breaks? Grease a 8″ X 8″ baking tray with butter and line with parchment paper or dust it with flour. Put water ¼ full in a pan and put it to boil. You need another pan or heat resistant bowl that will sit over the pan with boiling water. Add chocolate and butter to the smaller pan. Put it over the simmering water. The bottom of the pan should not touch the water. Stir constantly till the butter and chocolate melts. Add the cocoa powder and mix it well. Remove the pan from the bigger pan and let the chocolate cool down a bit. Sift flour and soda bicarbonate together. Add the salt and mix well. Put yogurt, orange zest (or vanilla) and sugar in another bowl and whisk it lightly. Add the flour and mix till the flour is incorporated well into the mixture. Do not over beat. Sprinkle the chopped nuts over it. Sprinkle a bit of sea salt over it. Bake the brownies for 30 -35 minutes. The top should not appear glossy and a tooth pick or a skewer inserted into the brownie comes out clean. Let the brownie cool in the tin for a while. Make sure the chocolate mixture has cooled down a bit otherwise it may curdle the yogurt. Don’t over mix or beat or whisk. Too much whisking incorporates air and on baking the middle will sink. The batter should not liquidy otherwise again the brownies will sink in the middle. Be patient let the brownies cool down in the tin. I just love the combination of orange and chocolate so added orange zest. You can add vanilla extract if you like. For an egg version visit Joy the baker. Yes dear I feel bad momentarily. My mother says a very beautiful thing, if there has to be any harm or anything bad let that happen through things and money not health and person. The recipe is very nice. The fudge brownies are super awesome. Nuts will give a nice crunchiness .. I add only a few walnuts.. this looks nice and nutty ! This chocolate fudge with laded nuts is tempting. How are you Mayuri and how is Mombasa. Fudge brownie sounds yummy. I can feel the chocolaty taste with the crunch of nuts. I also love the mixed taste of chocolate and orange. Fabulous share.